Samsung partnered with Wacom to create the touch layer on the screen of popular Note Series and we know how well that performs. 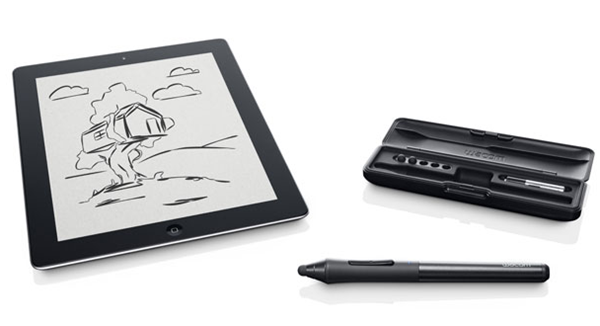 Wacom is one of the biggest players in pen tablet market and now Wacom and Love4 Apple have teamed up to provide you with Intuos Creative Stylus for iPad. This Stylus has been designed to “Unleash your creativity”. It syncs up with your iPad using Bluetooth which doesn’t tax the AAA battery in the Stylus as much and the battery can last an ample 150 hours of use. The Stylus will also come with an two Extra tips and a special case to keep them and Stylus safe. The pen weighs 25 grams and is expected to feel good in your hand. The Stylus detects 2048 levels of pressure and the activation pressure is 30 grams. The 6 mm Rubber Nib is replaceable. To us it rubber might not be as palatable and 6 mm is quite broad for a nib. Works with your Favorite Apps, from Adobe Ideas for iPad, to Autodesk Sketchbook Pro, and more applications will be integrated in the coming future. This stylus will provide you with an efficient way to make use of the extra screen real estate that iPad offers. Doodling on your iPad can be fun but you will have to think twice before you order this Spen for Rs. 6,475. Most Note users don’t use stylus, but those who do love it. But again the Note Stylus is deeply integrated with software. This Stylus will become more and more attractive as more and more Apps sync up with the Stylus including the general purpose apps like Call logs and Contact book. For now you can see in the promotional video below the abilities of this stylus. If you are one of the users who have been craving a stylus in Apple Eco system, here is one of the options that you can consider!